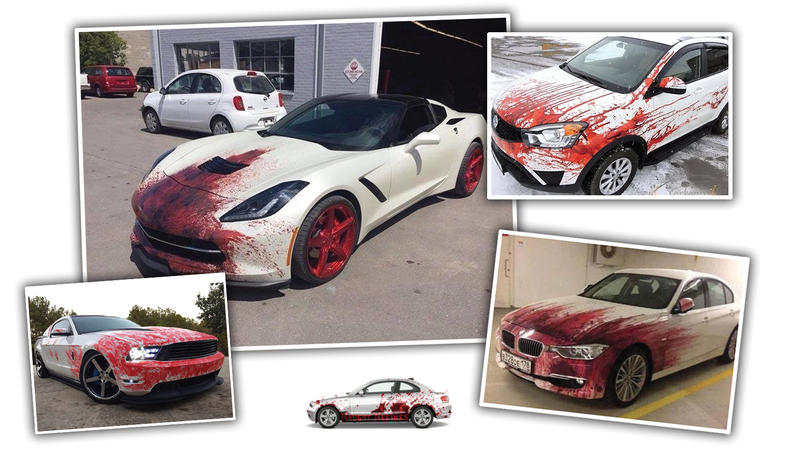 I’ll be honest, my finger must have slipped off the pulse of the automotive nation, because I was unaware that making your car look like it’s just driven through a slaughterhouse is A Thing, at least until I started seeing blood-spattered cars showing up various places online. I saw a post about them again earlier today, and decided to see what’s going on. All I really know is that this exists, and not in isolation. Turning your car into a giant used tampon exists. ...which is a pretty good point, and I’m guessing not the point these people were trying to make. But that leads to a great question: what is the point these wraps are trying to make? Hey, fellow motorists, I engage in murders? I enjoy killing people, but hate washing my car? My car has hemophilia? I really don’t get this. At all. Okay, for Halloween, that’s pretty good. If this stays on all year, well, then, we’ve got issues. If those are issues you have, you can buy these online. There’s people in the world asking about blood-spatter wraps for Priuses. You can even buy special bloody faces for your Jeep. If you really want your car to look like a murder weapon/tampon, be aware that you live in a golden age of possibility. Look, it’s your car, you do whatever you want to it. Spatter it with whatever bodily fluids move you. Your car, your vision. I’m just not sure what to think of someone who wants their car to look like this, though. Your choice of car says a lot about you, so if you want yours to evoke either a horrific nightmare or just remind people of the miracle of menses, then, I guess have at it? I want to know what you think—who would drive a car with a wrap like this? Any of you? If so, why? WHY? What&apos;s The Next Awful Auto Customization Trend?